With Azure Active Directory (Azure AD) reports, you can get the information you need to determine how your environment is doing. Sign-ins – The sign-ins report provides information about the usage of managed applications and user sign-in activities. 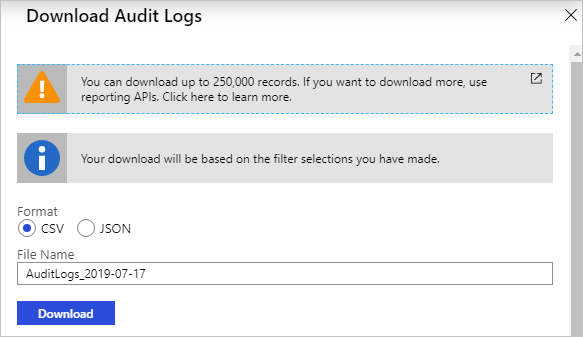 Audit logs - Provides traceability through logs for all changes done by various features within Azure AD. 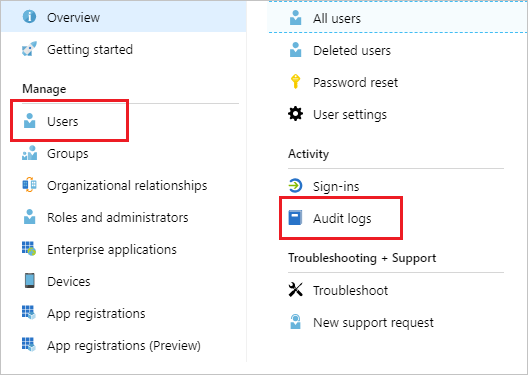 Examples of audit logs include changes made to any resources within Azure AD like adding or removing users, apps, groups, roles and policies. Risky sign-ins - A risky sign-in is an indicator for a sign-in attempt that might have been performed by someone who is not the legitimate owner of a user account. Users flagged for risk - A risky user is an indicator for a user account that might have been compromised. This article gives you an overview of the audit report. 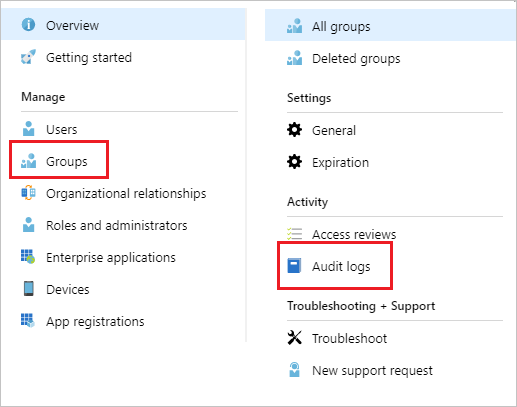 The Azure AD audit logs provide records of system activities for compliance. 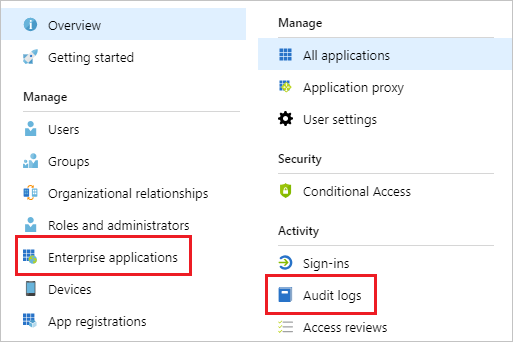 To access the audit report, select Audit logs in the Activity section of Azure Active Directory. Note that audit logs may have a latency of upto an hour, so it may take that long for audit activity data to show up in the portal after you have completed the task. You can customize the list view by clicking Columns in the toolbar. This enables you to display additional fields or remove fields that are already displayed. Select an item in the list view to get more detailed information. 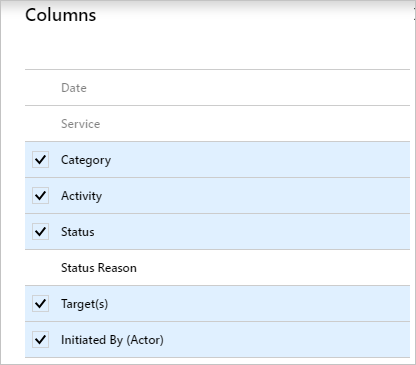 The Activity filter is based on the category and activity resource type selection you make. You can select a specific activity you want to see or choose all. You can get the list of all Audit Activities using the Graph API https://graph.windows.net/$tenantdomain/activities/auditActivityTypes?api-version=beta, where $tenantdomain = your domain name or refer to the article audit report events. The Target filter allows you to search for a particular target by name or user principal name (UPN). The target name and UPN are case-sensitive. The Initiated by filter enables you to define an actor's name or a universal principal name (UPN). The name and UPN are case-sensitive. The Date range filter enables to you to define a timeframe for the returned data. When you select a custom timeframe, you can configure a start time and an end time. You can also choose to download the filtered data, upto 250,000 records, by selecting the Download button. You may choose to download the logs in either CSV or JSON format. The number of records you can download is constrained by the Azure Active Directory report retention policies. What types of updates have been applied the users? How many users were changed? How many passwords were changed? What has an administrator done in a directory? What are the groups that have been added? Are there groups with membership changes? Have the owners of group been changed? What licenses have been assigned to a group or a user? If you just want to review auditing data that is related to users, you can find a filtered view under Audit logs in the Activity section of the Users tab. This entry point has UserManagement as preselected category. If you just want to review auditing data that is related to groups, you can find a filtered view under Audit logs in the Activity section of the Groups tab. This entry point has GroupManagement as preselected category. What applications have been added or updated? What applications have been removed? Has a service principal for an application changed? Have the names of applications been changed? Who gave consent to an application? If you want to review audit data related to your applications, you can find a filtered view under Audit logs in the Activity section of the Enterprise applications blade. This entry point has Enterprise applications preselected as the Application Type. You can view Office 365 activity logs from the Microsoft 365 admin center. 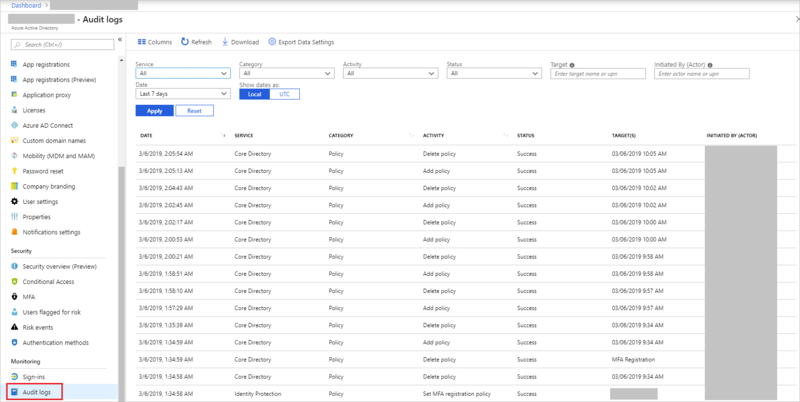 Even though Office 365 activity and Azure AD activity logs share a lot of the directory resources, only the Microsoft 365 admin center provides a full view of the Office 365 activity logs. You can also access the Office 365 activity logs programmatically using the Office 365 Management APIs.